Benjamin Franklin provided us with the following axiom: “An ounce of prevention is worth a pound of cure”. Using a preventative support model to enrich children’s lives, Shelldale Family Gateway (formerly known as Shelldale Better Beginnings, Better Futures) prevents children from experiencing poor developmental outcomes, thus avoiding costly health, education, and social services later on. 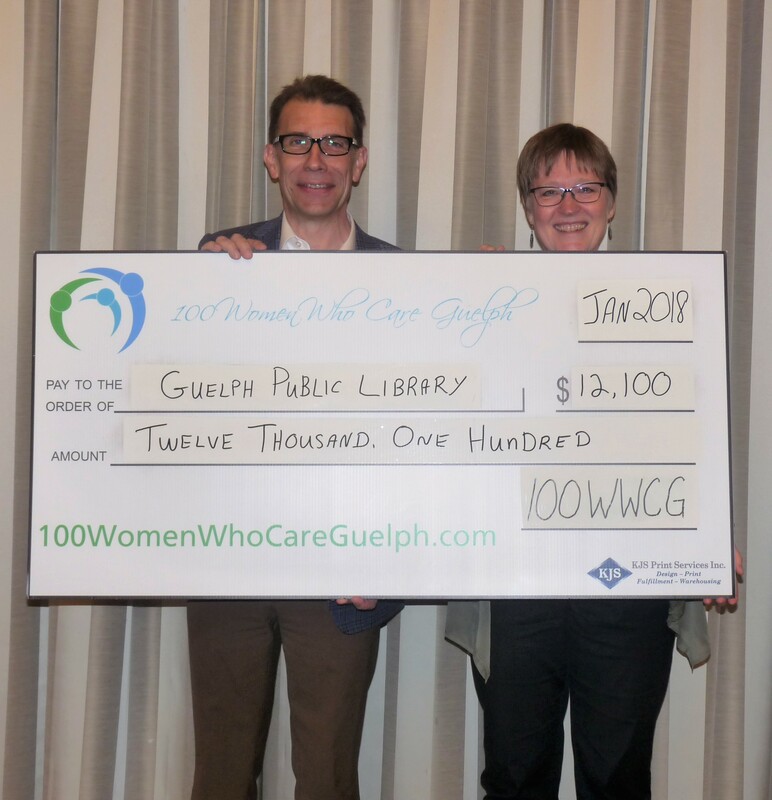 Members of 100 Women Who Care Guelph responded generously to that concept by donating over $13,000 to Shelldale. Preparing children to meet the challenges of living in and contributing positively to Canadian society is a monumental task, just ask any parent. 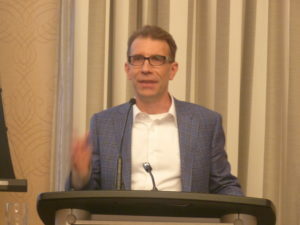 Those challenges are increased immensely if you are from a socio-economically marginalized community, or a recent immigrant with limited English language skills. Shelldale provides wrap-around supports through every stage of childhood to families in the Onward Willow neighbourhood, making sure that each child is supported every step of the way on that complicated journey. Shelldale begins by sending Peer Parent family home visitors out into the community to connect with new mothers, introducing them to the work of the organization. That service is offered in eight different languages to ensure each family is fully aware of the supports that are available to them, helping them to understand the powerful effect those supports can have on a child’s development. There are a variety of drop-in programs for pre-schoolers, followed by a breakfast program which ensures every child shows up at school well fed and ready to learn. For the tweens, there are art groups, a youth soccer club, after-school homework assistance, and many other programs designed to provide engagement, support and encouragement. Workshops in resume writing are offered to teens as they prepare to take up the mantle of adulthood and full participation in our society. Investing in our community, now and for the future, is what 100 WWCG is all about. 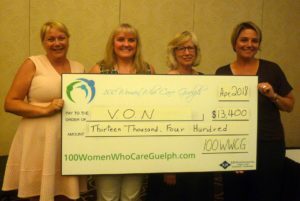 Visit www.100womenwhocareguelph.com for more information or to join 100 WWCG and help support those in need in our community. This entry was posted in Press Releases on July 17, 2018 by Tannis Sprott. 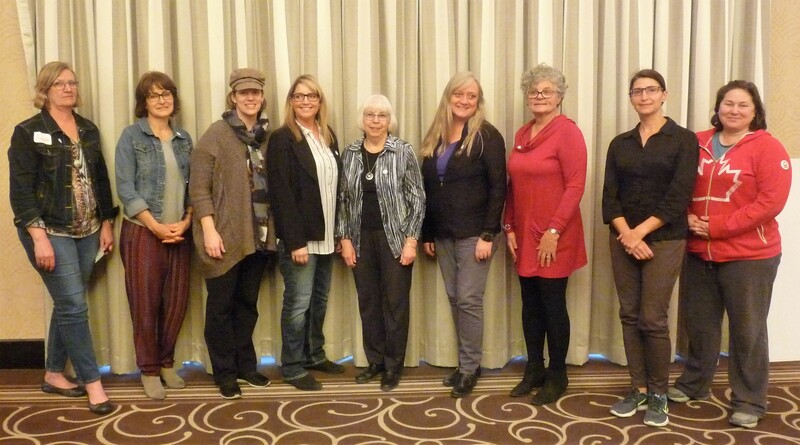 The Victorian Order of Nurses has been a part of Canadian society for 120 years, and last night the Waterloo Wellington Dufferin branch received the support of 100 Women Who Care Guelph at their quarterly meeting. VON’s nurses, personal support workers, therapists and other health care providers care for Canadians in their homes and communities. They offer more than 75 home care, personal support, and community services designed to help the frail and isolated, those suffering from cognitive impairments or dealing with chronic illnesses. Their help is critical to both the client and the care giver. 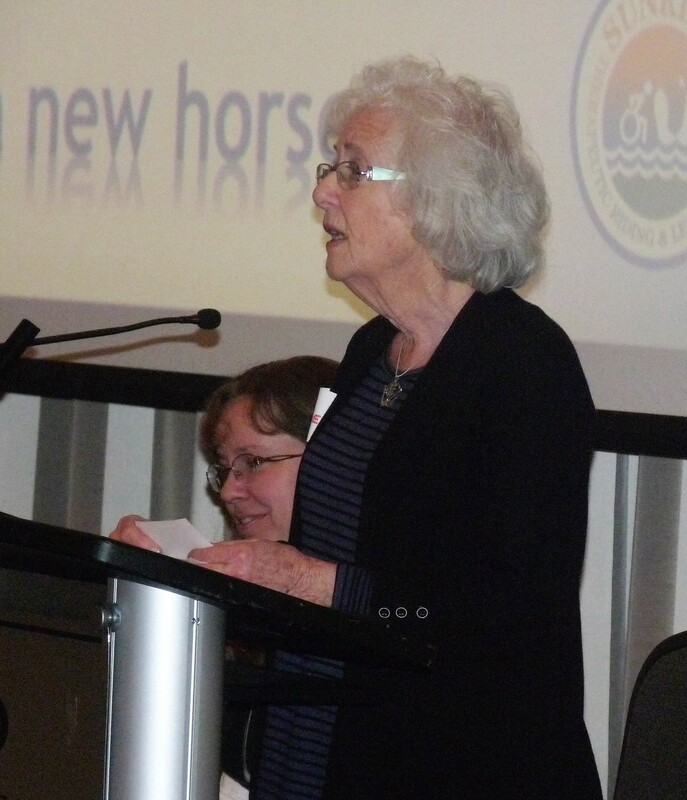 The members were taken on the intensely personal and harrowing journey of a fellow member as she related the importance and impact VON had made in her own life. When a family member received a life altering medical diagnosis followed by severe complications, she found her whole world turned upside down. VON become an integral pillar in her life as she struggled to cope with a changing reality. The message was clear – it can happen to anyone, at any time, you will need help, and VON will be there when that help is needed most. Within a week of reaching out for help, VON was there to assist. Of particular importance in this story was the Meals on Wheels service, as well as transportation to and from a myriad number of medical appointments over the course of her two year journey. Sometimes, there is just no going back to “normal”. When your whole life goes topsy-turvy and you need to find a new path, VON is there to support you in that transition. 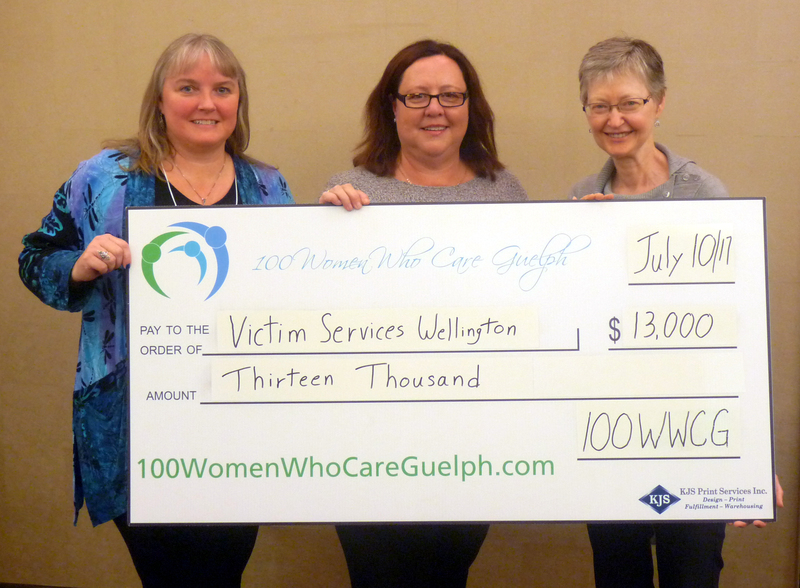 With a $10,000+ donation from 100 WWCG, many more people in our community will have access to that care and compassion. Visit www.100womenwhocareguelph.com for more information or to join 100 WWCG and help support those in need in our community. This entry was posted in Press Releases on April 24, 2018 by Tannis Sprott. If you still have to submit your cheque, payment instructions are at the bottom. You are now able to make payments online, as well! 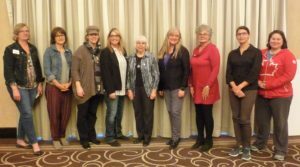 Our fourteenth meeting of 100 Women Who Care Guelph once again reaffirmed the commitment of our 136 members to supporting local community organizations! In spite of inclement weather, members turned out for an opportunity to listen to inspiring speakers making enthusiastic presentations for their chosen charities. Following this valuable get-together, Sharon delivered brief remarks and informed those present that our donation total is now $157,225. She also took this opportunity to remind members that if they have missed making a quarterly donation there is always an opportunity to make it online through our website. Lisa Hood presented on behalf of Guelph Public Library, Ontario’s oldest free public library, with a membership of more than 59,000 people. At least 39,000 are enrolled in programs at the library annually, with at least 25,000 hours of learning logged, making GPL a leader among library participation within Ontario, for the past 7 years. The library’s ongoing mission is expansion of collections and programming, including new technology and equipment. Tara Kanerva presented on behalf of Beginnings Family Services, a charity which provides pregnancy counseling and adoption services to clients of all ethnic backgrounds, religious affiliations, and walks of life. Services also include life skills training and provision of basic supplies for new parents. This organization also implements educational programs within the local school boards. 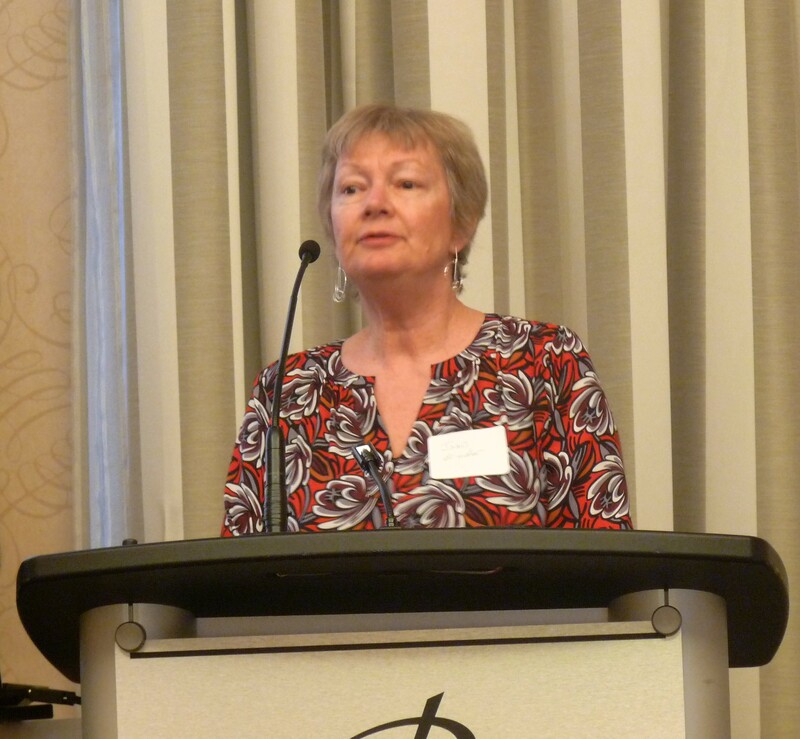 Barb Tremblay presented on behalf of Hope House, a poverty relief organization which provides compassionate assistance, with the emphasis on providing clients with “a hand-up, rather than a handout”. This organization’s initiatives include backpack and hamper drives, art therapy programs and a free choice food market, as well as a community garden/horticulture therapy program for those experiencing addiction, trauma or loss. A wholehearted shout out to everyone who provided thoughtful and insightful questions after each presentation. Your engagement with our presenters is essential to our mission! Most important, our members‘ continued generosity is key to 100WWCG’s success and the success of the charities we sponsor. After these inspiring presentations, members voted, and the selected charity was Guelph Public Library. When pledges come in from all members, our contributions will be directed towards expanding digital workshops for senior adults and providing additional literacy computers for the young. We look forward to hearing about the impact of that donation at our next meeting, on April16, 2018. You can read more about these exciting plans in Tannis’s press release online. Ann Caine. 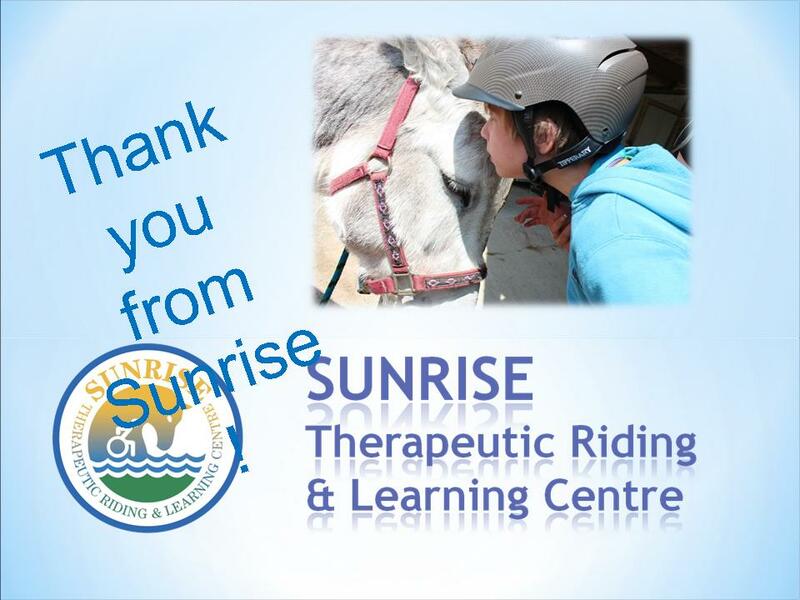 President and Volunteer Fundraiser says, “Thank you!” on behalf of Sunrise Therapeutic Riding & Learning Centre. While we were waiting for the results of our voting, members had the pleasure of listening to an inspiring presentation by Ann Caine, nominator of Sunrise Therapeutic Riding & Learning Centre, who gave a very moving “Thank you!” to the group, for our October donation. 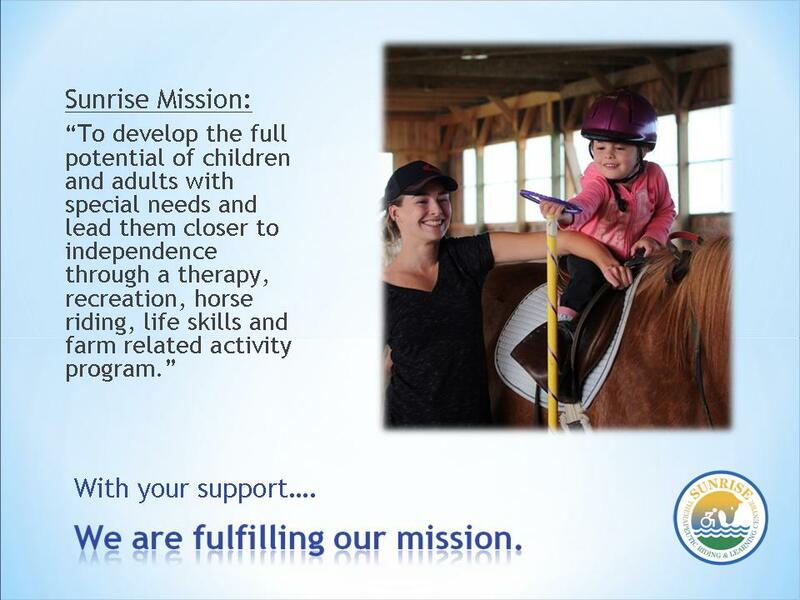 She emphasized the significant impact our financial assistance will bring to the kids Sunrise serves, through the purchase of a new horse (which she assured us would be done as soon as one that is temperamentally suitable can be found). 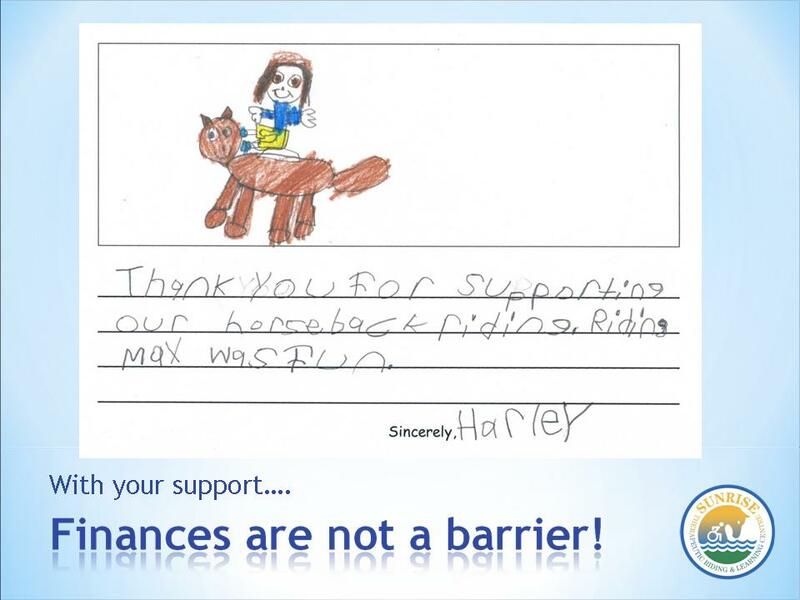 The funds also sponsor horses and classes, providing subsidies which will make it possible for more children to enjoy the freedom, camaraderie and exhilaration of spending time in nature, engaging in physical activities and experiencing the joy of connection with the animals they love. We are also offering the option of making your payment online! Three-year pin recipients were happy to receive their pins and commemorate their accomplishment with a photograph. Sponsor Stephanie Birt of Blue Ocean Office Supplies and Solutions (far right) participated in the ceremony. Finally, Sharon and Stephanie Birt of Blue Ocean Office Supplies & Solutions presented three year pins to all members who had fulfilled a commitment to donating to chosen charities for a full three years. 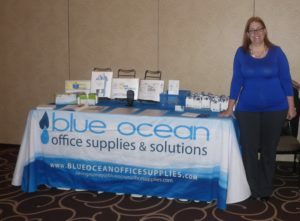 Stephanie Birt, owner of Blue Ocean Office Supplies & Solutions is the sponsor of our commemorative pin initiative. Blue Ocean is 100WWCG’s newest sponsor, committed to supporting our commemorative pin program. We are proud to engage in this exciting partnership because we believe that the mission alignment between both organizations will allow us to have a big positive impact now. As the video on their website demonstrates, 100WWCG members who make purchases through Blue Ocean Office Supplies & Solutions, will see their chosen charities benefit as well! This entry was posted in Notes on Meetings on January 16, 2018 by Miriam Vince. It is my pleasure to bring you a report on the impact of your financial support for Sunrise, in the form of a power point presentation, (which is presented below). As most of you know, our program focuses on the empowerment experienced through human animal bonding and a farm activity program. With your support we are fulfilling our mission. 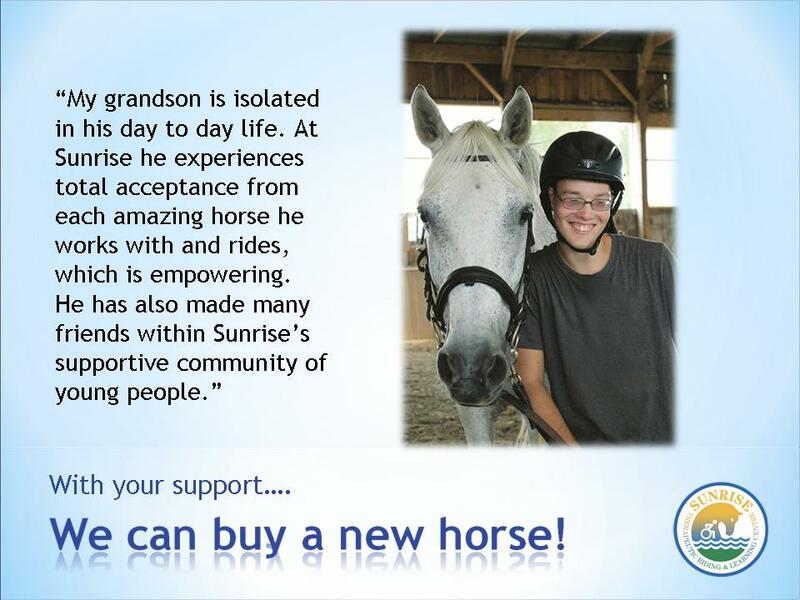 I would like to introduce Dallas, the therapy horse you are sponsoring this year. 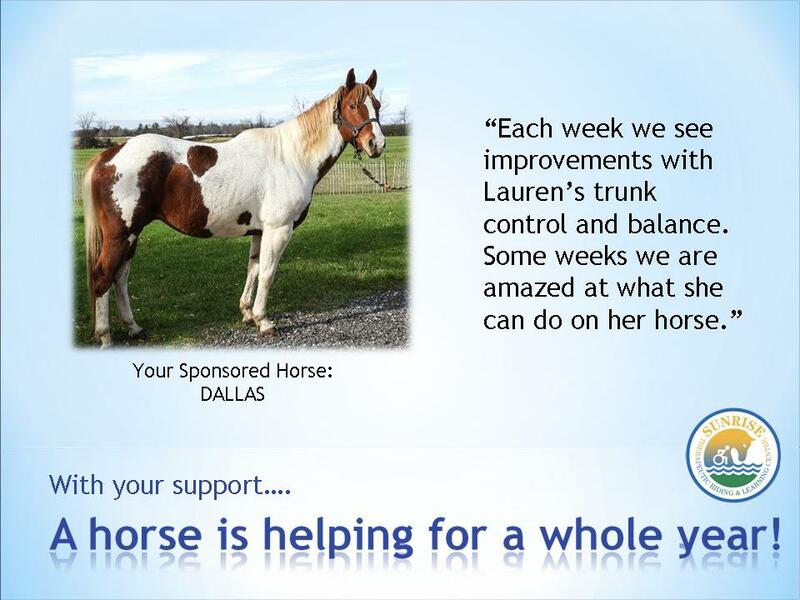 We are still actively seeking new horses, and when we find one to buy with your funding, we will forward a photo. Special Education classes come to Sunrise on a rotating basis, throughout the Fall and Spring. You have enabled 4 classes to participate, through the scholarship fund. Teachers and students are active in sending thank yous! 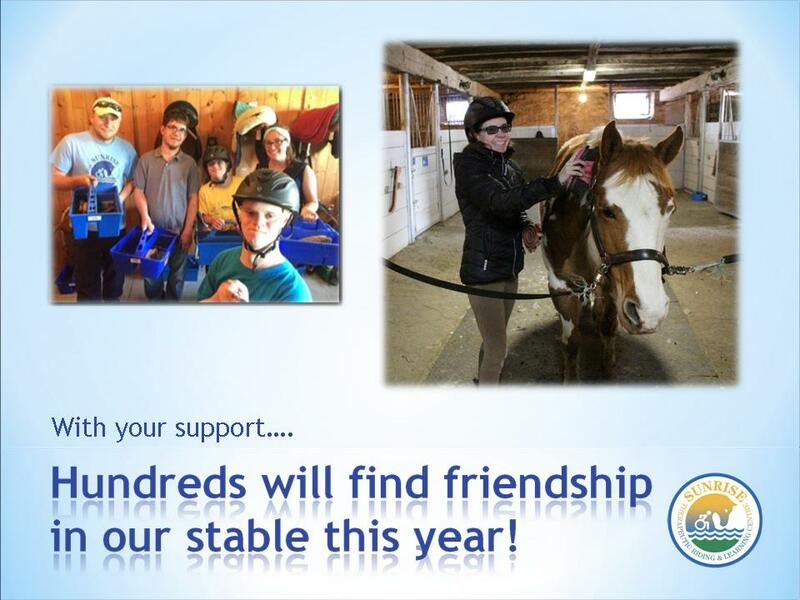 Throughout the year hundreds will find friendship in our stable! Not only riders but a huge team of volunteers — and the many visitors who see the stall appreciation plaques. 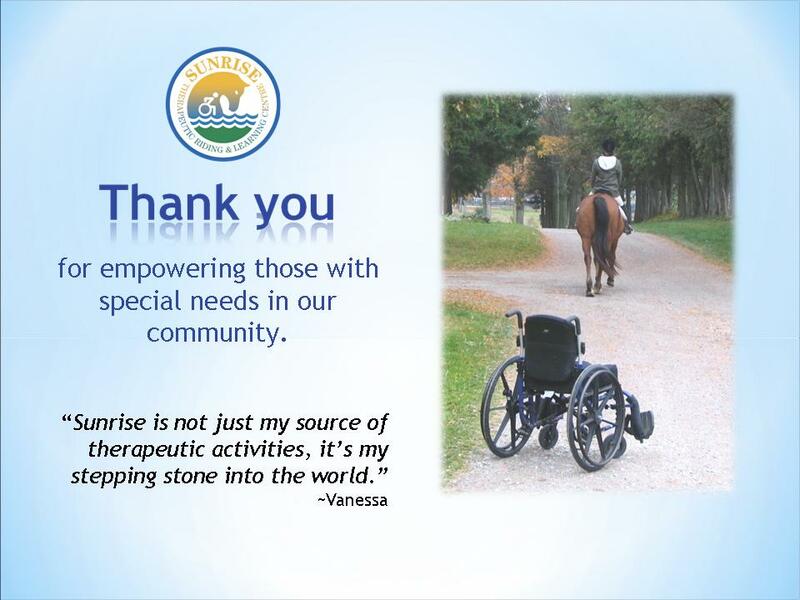 Thank you again for partnering with Sunrise to empower those with special needs in our community . This entry was posted in Chosen Charities say Thanks on January 16, 2018 by Miriam Vince. 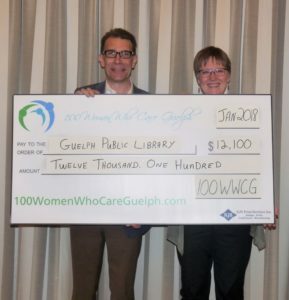 The Guelph Public Library is the latest charity chosen by 100 Women Who Care Guelph to receive their $10,000+ donation. Our library, the oldest public library in Ontario, has been serving Guelph for 133 years. It has also held the record for highest per capita use in Ontario for the last seven years. As such, it reaches deeply into our community, bringing together a huge cross-section of Guelphites. In all that time, the ways in which they serve the citizens of Guelph has changed dramatically, expanding well beyond the loaning of books. The public library has turned into a key resource for access to today’s digital technology. That access is becoming increasingly important in our society, and if you don’t have a computer at home, or are ill at ease with their use, then the library is there for you. This is where 100 WWCG can help. Thanks to their generous donation, the library will use a portion of the funding to work with seniors who may feel uncomfortable using modern technology. They will provide tech and digital workshops offering a number of services; teaching a grandmother how to connect with her grandchildren on facetime; introducing you to borrowing ebooks as they continue to grow in popularity; if you need a little help at their Tech Bar using a 3D printer, they can help you with that process too. As they say, this is not your grandmother’s library. The remainder of the donation will be used to fund more early literacy stations for very young children. There are already 25,000 hours of learning per year, reaching out to moms and toddlers and delivered at all the branches in Guelph. Now they can expand those critical programs. 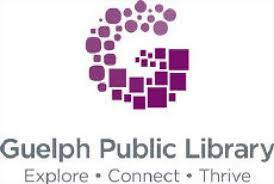 The Guelph Public Library is there for everyone, at any stage, connecting us as a community and helping us grow. Learning is a lifelong pursuit, and 100 WWCG is delighted to help with that process. 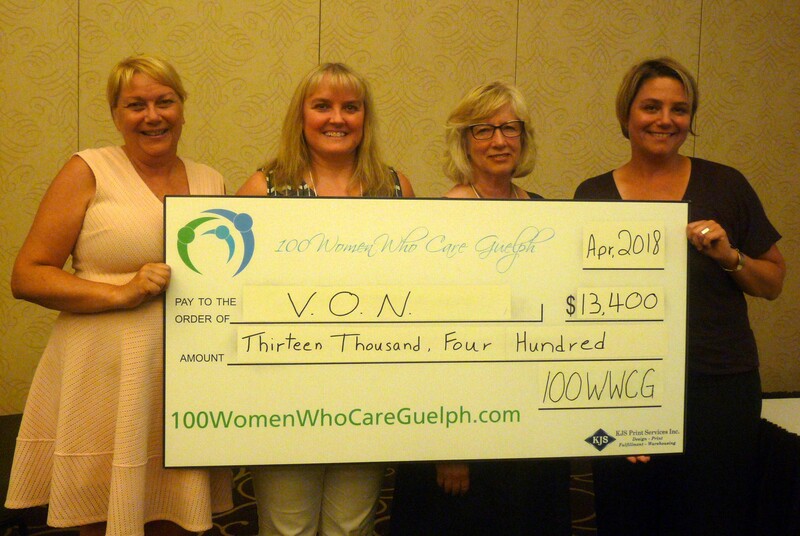 To find out more about 100WWCG, see their impact on our community, or to become a member, visit their website at www.100womenwhocareguelph.com. This entry was posted in Press Releases on January 16, 2018 by Tannis Sprott. As you have probably heard from the presentations Project Lifesaver started in the United States and when I was told about it in 2011, I could not understand why we did not have more of these programs across Ontario! I am still baffled by this today. 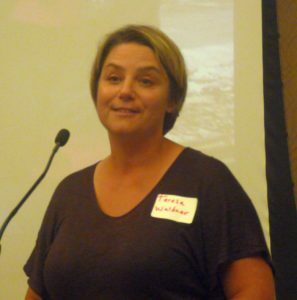 Liz Kent, Executive Director of VSW says “Thanks!” to 100WWCG for their July donation to “Project Lifesaver”. 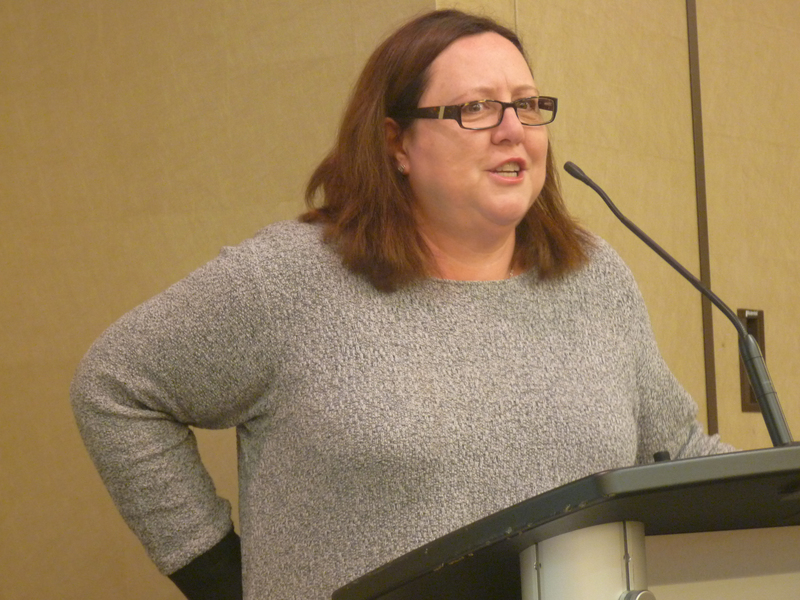 My name is Elizabeth Kent and I am the Executive Director of Victim Services Wellington. We have 3 full time staff and approximately 85 volunteers. We provide on scene assistance to victims of crime and tragic circumstance 24/7 365 days a year! We are dispatched to assist victims by emergency services. Missing persons calls are one of the calls we respond too when called by emergency services. I have no problem saying I have attended to assist a family whose mother /grandmother was missing and I never want to do that again! It was awful, this person was missing 22 hours and it was not only hard on the family but on everyone involved. As time went on and the hours ticked by you knew the chances of finding this person alive was less and less. This mother /grandmother had dementia so we knew she would not find her own way especially after being gone so long. This call for me was many years ago but when I heard about Project Lifesaver I was brought right back to that living room and the many tears! Please note there was a successful conclusion she was found alive! However, the pain and anguish the family went thru was awful. When I was approached about Project Lifesaver, I did not see how we could not want this service in our community especially with our aging population. Therefore, with the help of my Board, volunteers and the Police Services (Guelph and Ontario Provincial Police Wellington) we made it happen in late 2011. Sharon Lewis presents a 100WWCG cheque to Liz Kent of VSW and Robin Smart, the nominator of our July chosen charity, “Project Lifesaver”. Since receiving word that we were the recipients of 100 Women Who Care we have had four searches two in Wellington County and two in the City of Guelph. One of the searches the elderly man lives in the area by Eramosa Zehrs and was located out by Costco in 36 minutes from the time he was reported missing. Another search in Fergus was for an elderly person who left the retirement home in the morning and they did not realize she had not been back until 5:30. This program assisted the police in locating her in under 40 minutes. In total, we have had 16 searches and found people quickly. I would like to thank everyone for being part of this group and supporting the agencies in Guelph and especially for supporting our program. You are helping to give caregivers/loved ones a peace of mind and that is invaluable! I look forward to being a member of this group. This entry was posted in Chosen Charities say Thanks on October 17, 2017 by Miriam Vince.